Yes, you read that correctly. It's not chocolate-covered raspberries, but raspberry-covered chocolates! So simple, so easy, but so kind-of-fancy! Just pop a chocolate chip (the white chocolate ones are really yummy) into a fresh raspberry. Our fruit market just had raspberries on sale, so I've been packing raspberries and chocolate chips in the kids' lunches and letting them put them together themselves ~ huge hit! Thanks, yet again, Pinterest, for an awesome idea. love this! Definitely making this ASAP! We put blue berries in raspberries & they look like googly eyes! We love playing with food together as a family :) I posted a picture on my facebook page "Noodleonthat Food Revolution" if you want to see what my kids did. I'll have to show my kids your mini chocolate chip idea, they'll be begging me to go to the store & grab more raspberries! 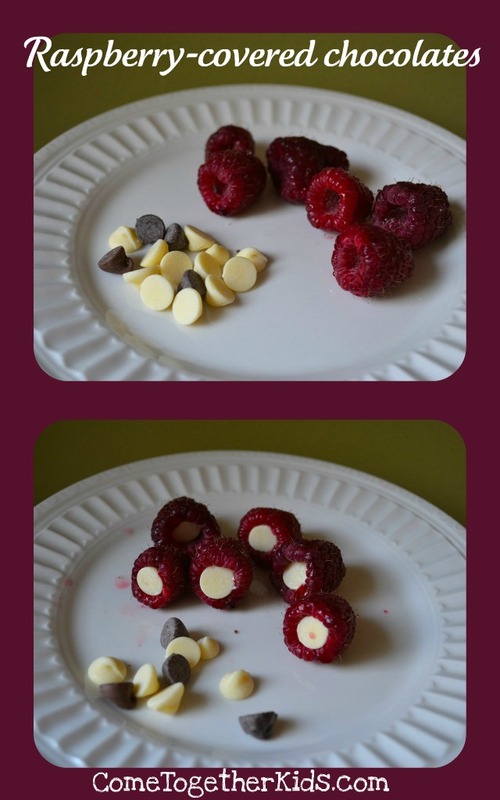 Oh, I am SO going to try these....when I get more raspberries. I ate the last of them yesterday! Wow! That's a lot of raspberry chocolates! I just hope that those raspberry are not too hard because I currently have a dental implants new york city. I don't want to ruin it by eating a candy that's too hard. On the off chance that you claim a vehicle, you can set up the title up as insurance and get a credit in light of the estimation of the auto. So simple and easy. Thank you for sharing the idea!